These clever kitchen combo's, combine two for one in a selection of different sizes. Inspired by necessity each design solves it's own problem, whether it be for storing diner's condiments, cook's concoctions, a pleasant bar snack selection or tasty olives and a place for their pit's. 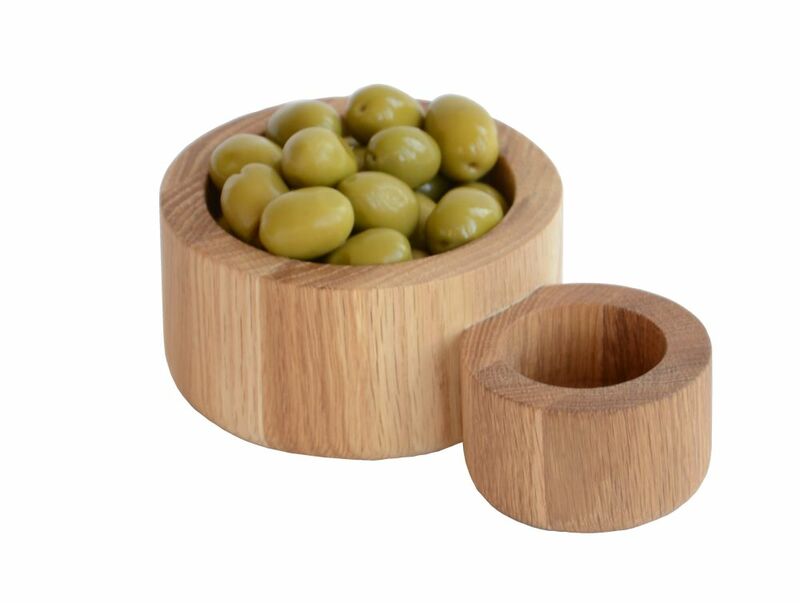 Olive features a protective, fitted glass insert. Inspired by the figure '8' a symbol of luck in Asian culture the designs explore 'duo-functionism' and form an attractive ensemble in any kitchen, contemporary or classic. Designs by Lincoln Rivers. Wipe with a damp soapy cloth. Rinse briefly and dry. Do not leave in contact with water. Apply vegetable oil to maintain finish. Crafted by hand and made sustainably from white oak.